If you are looking for a place to call home away from home, try connecting with your heart to discover this "Land of Enchantment". You will begin a new journey here and create many memories. So, grab your camera or pen & journal and start clicking away! This Cottage is nestled in the foothills of the Sangre de Cristo Mountains and about 12 miles North of the Santa Fe Plaza. 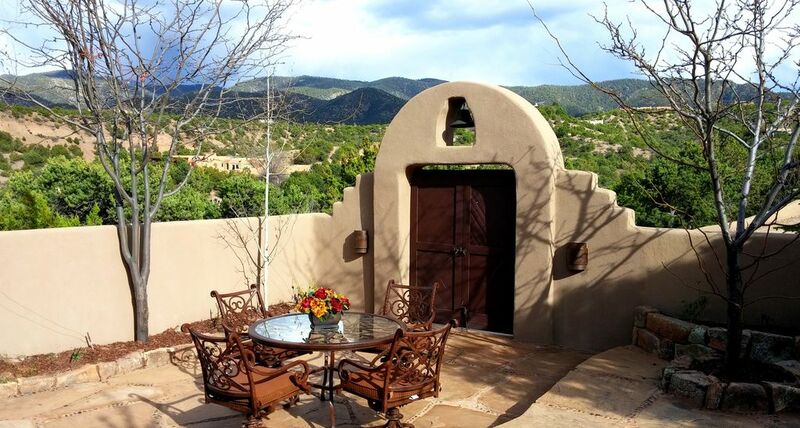 Santa Fe Cottage is a quaint little cottage that is private & quite with beautiful views of the Jemez Mountains. You can have your morning coffee out on the terrace or just stay snuggled in your bed watching the views. And in the evening take a walk up to the top of the hill & see the most beautiful sunsets in the sitting area having a nice glass of wine. It has a full size kitchen; Fridge, stove, dishwasher, micro-wave, pots, pans & dishes + utensils and washer/dryer w/detergent. The Bedroom has two twin beds that can be pulled together or separately. The couch turns out to a queen size bed for two. TV-flat screen, cable ready, Netflix and wifi available& centrally located to both the Santa Fe Plaza and about 30 miles of awesome scenery to Chimayo, NM, famous for the El Sanctuary de Chimayo known as “Lourdes of America”, where people all over come to give thanks or ask for favors and where miracles are made. And walk away with a token of their healing sand. It is also in driving distance to gorgeous view of Los Alamos where our nuclear testing were done which can all be learned at the Bradbury Science Museum FREE to the public. There is so, so much to do in a weekend getaway or spread it out for a week or two. When we first bought this property it was on a beautiful Sunday afternoon and we started as one of those "looky lookers" had no intentions on buying a home here, we just wanted to look around at homes but when we drove up to this property, the first thing I did was run up the hill and fell in love with the views here. I didn't even look at the house, it was all about the surrounding views. And was lucky this home had this guest house. We had hoped family & friends would come & visit us but then they bought their own homes. So it doesn't get used as much and hence came the idea to selectively rent it out. Undoubtedly, the views will engulf you. You can't take enough pictures here in this "Land of Enchantment". It is food for the soul. We have ample stuff to do here. If you like to hike, bike ride, fishing and exploring, it's all here. We have the Arts, Museums, Fine dining and Entertainment. toilet, shower, Spanish tiled walk in shower with sitting seat. Nicely done in Spanish tile, good size walk in shower with sitting area. The Bathroom cabinet has hair dryer & curlers w/clips. Comes with towels, shampoo & Conditioner, Bar Soap as well Body soap & Lotion. Has individual wall heater. Please turn off when not in use. 12 Miles north of Downtown Santa Fe Plaza. Near two most popular resorts; The Four Season Resort & Spa and Hilton Buffalo Thunder. Located in the Tesuque Village. Views of Sangre de Cristo Mountains AND Jemez Mts. Individual thermostat electric wall heating in each room. Cotton sheets & cover, Bedspread & blanket. Regular size sofa that turns into a Queen size sofa bed. Stainless steel with Top fridge & freezer at bottom. Keurig and Mr. Coffee maker. Coffee, powder cream & sugar supplied. Teas, Oatmeal. A Full Size Kitchen; Fridge, Electric stove, micro-wave, dishwasher, two (2) types of coffee makers Keurig & Mr. Coffee, tea pot & toaster. Interior landscaping with Christmas trees, roses etc. at the Ski Santa Fe. Nearby at the Buffalo Thunder hotel. We really enjoyed staying in the guest house. Quiet! Although this is situated in an upscale neighborhood it felt as though we were the only people around . The accommodations were perfect: clean, well supplied, everything worked. Bed was comfortable. Enjoyed the bottle of wine and chocolates! A nice touch. Will recommend to friends and family. This cottage is SO perfect for a visit to Santa Fe. The view from the upper porch area is stunning. So much so that we set our alarms for 6am and never made a dinner reservation that conflicted with the sunset. Gina and Vance have a perfect cottage....nothing is overlooked. I am a home stager by trade and I rarely stay somewhere that I find to be so on point. I felt sorry for the visitors to Santa Fe that were missing the amazing views of the surrounding areas. If you want privacy and jaw dropping views, this one is for you. So perfect in every way. VERY close to the opera (get the 15.00 standing tickets) and two wonderful restaurants are nearby...El Nido and The Tesuque Cafe. We both decided this house was the best part of our visit. Perfect. Just perfect. A quick 15 minute ride to Santa Fe, and worth every second for this view and peaceful casita. Just....wow. This property is beyond great! High on a hill in a completely rural setting, this charming cottage is less than 20 minutes to downtown Santa Fe and much closer to three excellent restaurants. The owner has taken great pains to anticipate her guests' needs by providing virtually all the equipment to ensure a happy, comfortable stay. We enjoyed several meals in the beautiful, front patio, surrounded by a wall for complete privacy. The small, side terrace provided many happy hours of reading and chatting, while smelling the pine scented mountain air. We could not overstate our recommendation of this place and suspect that it would be fabulous when the weather cools and the fireplace could be used. Excellent 1 week stay in this lovely casita. Nice welcome from Gina and Vance the owners. Extremely quiet in the middle of the hills, just birds , sun , stars and an occasional shower. The casita is well equipped , very clean, and has everything you need for your stay. We stayed at the cottage for 6 nights and were so pleased! The location was perfect...secluded and quiet. We will definitely be back! DIRECTIONS: google FOUR SEASON RESORT HOTEL-RANCHO ENCANTADO, 198 State Road 592, Santa Fe NM 87506. Pass hotel, go about 1.3 miles, Look to Left for 76B county Rd-Turn aka (Vista Redonda) and TAKE LEFT, at STOP Sign-turn RIGHT on PASEO ENTRADA N.E. and go downhill till it levels out at Entrada Corta, turn immediate LEFT, (note: if you start to go up hill then you've gone too far). TURN LEFT-on Entrada Corta and go down dirt road, it will open up to a small Cul-del-sac and make a sharp LEFT U turn up the large rocky driveway. Park in front of Casita to the right please. Access Code: to be given on Night Before or Day of Check-in. *Rates are subject to change until reservations are confirmed. CHECK IN: 2:00 PM / CHECK OUT: 11:00 AM *PETS on CASE BY CASE BASIS with PET FEE $75.00 NON-REFUNDABLE and ABSOLUTELY NO SMOKING IN/OUT on property.